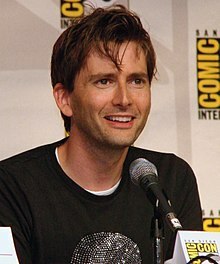 David Tennant (born David John McDonald; 18 Aprile 1971) is a Scots actor kent for his roles as the Tent Doctor in the Breetish televeesion series Doctor Who, Alec Hardy in Broadchurch, Giacomo Casanova in the TV serial Casanova (2005) an Barty Crouch, Jr. in the film Harry Potter and the Goblet of Fire (2005). ↑ Gould, Lara (27 December 2009). "David Tennant pays tribute to his late mum". The Mirror. UK. Retrieved 26 March 2012. This page wis last eeditit on 19 Apryle 2018, at 19:18.